Today the World of Ink tour brings us our guest. 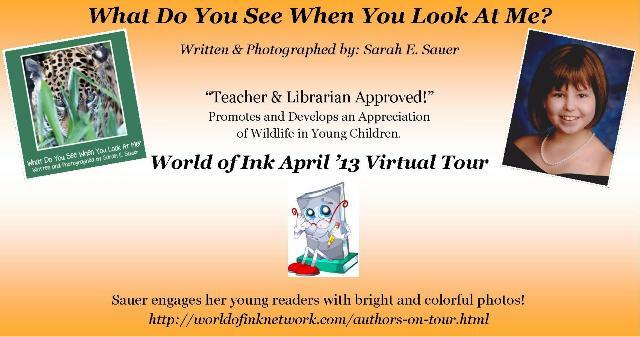 Author, Sarah Sauer, is here to talk about her book, What Do You See When You Look at Me? In What Do You See When You Look at Me? the author engages her young readers with bright and colorful photos and invites them to see more than just an animal but to look at the beauty of each creature in detail. Kai: Welcome to Strands of Thought, Sarah. What age range is your book for? Sarah: 2/3 years to beginning readers 7/8 yrs. Sarah: I remember frequent trips to the zoo with my parents. I loved animals. I loved any living creature. In fact, when I was about 3, I used to love to go outside and dig in the dirt to find ants and roly polys. I used to name the insects and called them my friends. I got my first ant farm when I was three because my mom found my ant friends living in my dresser drawer and told me that this was not a proper home for them! Kai: Oh my gosh, what a great story! Your poor mother, ha ha! How has life changed for children today than when you were that age? Sarah: Technology has really changed and children today live in a world of computers, iPads, iPhones and ebooks. Sarah: Children are still fascinated by animals and insects. Sarah: My plastic toy animal collection that I would play with and take with me everywhere we went. I loved to play and make up stories with them. Kai: What inspired this book and how did you decide on this age range for your book? Sarah: Well, it was an assignment I received when I was in one of my early childhood classes. I had to create a project that showed my goals for my chosen profession. I remembered how my high school digital photography teacher, Ms. Iles told me I had a talent for telling stories with my photos. So I used my photos and put together a simple picture book for preschoolers. I found that I really liked teaching the preschool age group through my volunteer work at the zoo and preschool. Kai: Finally, I have four kids. Over the years, they’ve attended a lot of birthday parties. I love building a theme gift around a book. If you were to give a gift basket to a child based on your book, what else would be in the basket besides What Do You See When You Look at Me? Sarah: I would include a set of animal toy figurines for them to play with along with an outdoor explorer kit that includes children’s binoculars, magnifying glass, an inexpensive camera or disposable camera, animal puppets, puzzles, coloring books, animal songs cd and passes to the local zoo if their parents did not have a membership to the zoo. Kai: Sounds like a great gift! Readers, you no longer have to think up one yourself! Thanks for visiting with us and sharing information about What Do You See When You Look at Me. Readers, we want to hear from you! What is your favorite animal and why? 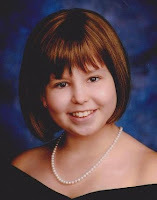 Sarah E. Sauer is a childhood brain cancer survivor. She is also an animal lover. Sarah’s love of animals was something she drew on for strength throughout her illness. 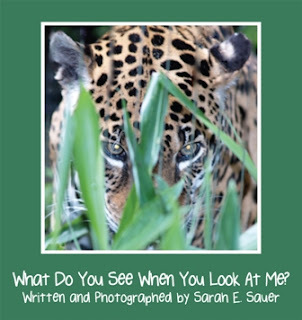 In her first children’s book, Sarah shares her love and respect for wildlife animals through her photos she took for her high school digital photography class. Sarah is currently studying early childhood education and hopes to share her love and knowledge of animals to promote and develop an appreciation of wildlife in young children. She currently lives in Corydon, IN with her family and her horses, llamas, donkey, cats and dogs. Thank you for hosting Sarah on your blog and letting her share about her wonderful picture book for kids. I'm glad she could stop in and share her book, Virginia. Thank you!